We offer genetic diagnosis services and clinical biochemical services for hereditary hematological diseases. Our genetic studies detect the presence or absence of pathogenic mutations in genes responsible for hereditary hematological diseases. Genetic analyses are performed using the latest technology: NextGenerationSequencing, in a set of updated genes responsible for the disease studied. BG goes beyond providing genetic testing results and our genetic reports include clinical recommendations written by hematologic medicine professionals for patient treatment and management. Get more of your genetic results with us! We are at your service to advise you on the suitable genetic test to perform. 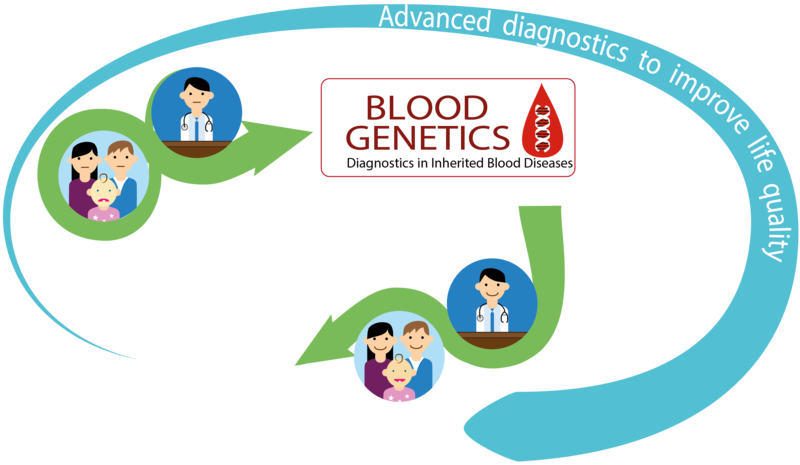 Ask us with no cost or obligation at info@bloodgenetics.com! Our biochemical studies measure the Hepcidin levels (hormone that regulates iron metabolism) in serum or plasma by ELISA and measure the Labile Plasma Iron (LPI) in serum or plasma using the Aferrix kit for diagnosis and monitoring of iron toxicity and iron overload in serum or plasma. We offer genetic studies for the diagnosis of hereditary hematological diseases. Our genetic reports include clinical recommendations written by hematologic medicine professionals for the treatment and management of your patient. We advise you without compromise on the most appropriate genetic test. We offer clinical biochemical studies to detect the levels of Hepcidin Hormone and Labile Plasma Iron (LPI) in serum or plasma for the diagnosis and monitoring of toxicity / iron overload.